As a downhill rider, please follow the instructions of cable car personnel and Bike Park employees. Since downhill riders will be taken as far as Sunnegga paradise and to Gornergrat by train, please adhere to rules regarding the transport of bikes on trains. Downhill rides can be dangerous, therefore you should be aware that this sport is associated with unusual risks that are not completely covered by normal insurance such as SUVA and therefore look to obtain personal accident insurance which covers the additional risks, as well as personal liability insurance in the case of damage to third parties. If accidents should occur, you should also remember that Zermatt Bergbahnen AG and Gornergrat Bahn completely reject all liability for accidents and damage to property, so remember to setup your own insurance needs before-hand. Unlike normal biking, downhill can be dangerous so wearing helmet is obligatory and make sure to wear appropriate protective clothes such as proper jackets and shoes. Weathers up in the mountains can change rapidly, so don’t forget to pack waterproof jacket and maybe a pair of pants if you’re planning to wear shorts. Every downhill rider is obliged to get a start number at the Sunnegga paradise valley station or Gornergrat Bahn and must display this in full view during all rides and to return this when it is no longer valid. No downhill rider will be able to use transport without a number and in case of accidents or damage, you must report immediately. If you leave the marked course, you will be charged with a fine and your ticket will be withdrawn and will not be replaced. 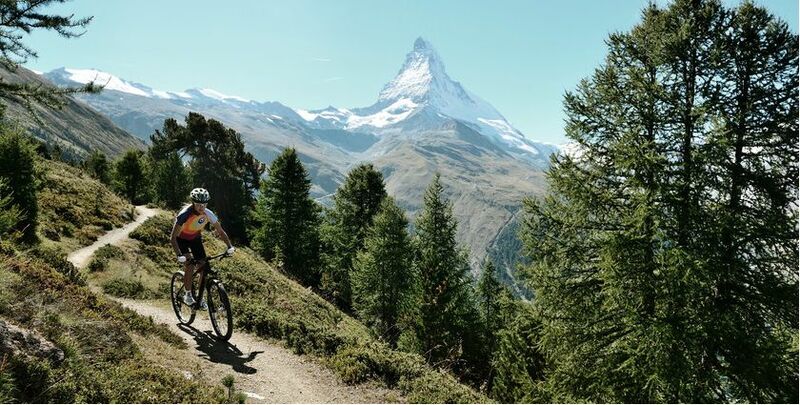 Just like biking, if you need gear, you can purchase or rent at the many sports shops available at Zermatt. Keeping these rules in mind, you can have an excellent time in Zermatt whizzing through the gorgeous alpine paths with either the view of the beautiful lakes or some of the four thousand meter peaks that is surrounding Zermatt. Just don’t forget to bring refreshments with you while biking since it can get hot during summer. You can also take bathing suits with you to go swimming in the lake, and don’t forget to take photographs since some of the mountain lakes around Zermatt offer beautiful reflections of the magnificent Matterhorn. If you don’t know which trail to take, just check the tourist map which many hotels offer or just go to the station where they offer a brochure.